Xavier Rohart and Pierre Alexis Ponsot (FRA) fought like attack dogs against a pack of 144 wolves for the choice filet mignon from Porcão. 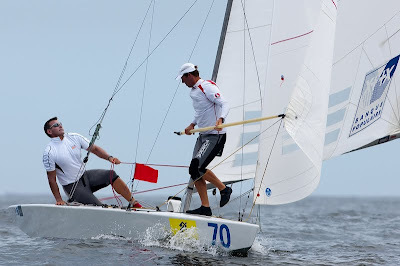 They won the pin and the left hand side of the course during the start of Race 3 of the 2010 Star World Championship in Rio de Janeiro. Renato Cunha and Marcel Mascarenhas (BRA), Iain Percy and Andrew “Bart” Simpson (GBR), Gustavo Lima and Charles Nankin (POR) and Diego Negri and Nando Colaninno (ITA) led the attempt to hunt down the French, but didn’t have the stamina to get the job done. The 2003 and 2005 Star World Champion, Rohart, and Ponsot won the light air race under cloudy skies with a margin that matched Lars Grael and Ronald Seifert’s horizon job during the final race of the 2009 Star World Championship in Varberg, Sweden. Their sensational start and great first beat up the left hand side of the course gave them a comfortable lead at the first weather mark, and they extended from there. Percy/Simpson made good on yesterday’s promise to perform better today. With their second place finish, Percy/Simpson move to the top of the leaderboard. Alan Adler and Guilherme Alemieda (BRA) finished 11th. Their three-race total of 22 points places them 6 points behind the 2008 Olympic Gold Medalists. The Brits and Eivind Melleby and Petter Morland Pedersen (NOR) made the biggest gains at the front of the pack. The Norwegians’ fourth place finish today raises them to third overall in the regatta. The surprises in the race came from the newcomers to Star sailing. Cunha/Mascarenhas had practice one day together and Cunha has only been in the boat this season. His advantage is that he has been a local harbor pilot for 15 years and knows what to expect during different tidal and wind conditions. The pair hung with the big boys, even during the final beat when the wind came up and all of the crews were hiking. Percy/Simpson crossed the finish line at the pin end on starboard and Cuhna/Mascarenhas dipped the Brits stern to take third place. Lima/Nankin showed remarkable poise by rounded the first weather mark in fifth place, holding on for a long while and finishing in ninth, right behind compatriots, Juan K. and Alejandro Calla (ARG). Defending Star World Champions George Szabo and Rick Peters (USA) had their best performance thus far and finished in 10th place. Photo of Xavier Rohart, Pierre Alexis Ponsot and their coach by Fried Elliott. Preliminary Results following Race 3 of the 2010 Star World Championship in Rio de Janeiro.